1. Recondition with MegaSporeBiotic – clinically researched spore-based probiotic that increases microbial diversity and encourages the growth of key health-promoting commensal gut bacteria. The first 100% spore-based probiotic has been clinically shown to improve leaky guy by 60% in just 30 days. It even maintains efficacy during antibiotic therapy. 2. Reinforce with MegaPreBiotic – clinically tested pre-biotic that selectively feeds particular beneficial bacteria. This is a precision prebiotic. Made of non-digestible oligosaccharides (type of carbohydrate) that reinforce the beneficial changes created by MegaSporeBiotic to promote a strong and diverse microbiome. 3. 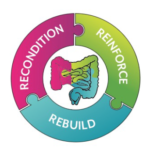 Rebuild with MegaMucosa – key amino acids that help rebuild a healthy mucosal barrier as well as immunoglobulins and flavonoids to support healthy mucosal immunity and alleviate barrier dysfunction. 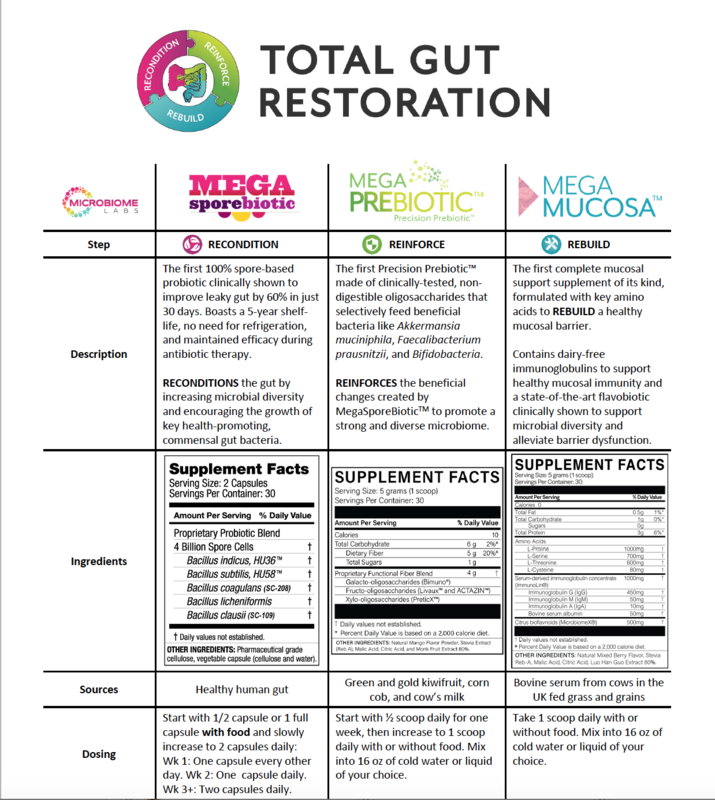 The chart above gives more detail the Total Gut Restoration program, the products and how to dose. 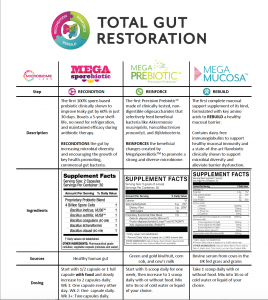 Or click here for a PDF of the Microbiome Labs Gut Restoration Chart. Of course, a key part of promoting a healthy gut is eating a healthy diet to provide necessary nutrients for both you AND your gut bacteria! A healthy diet should contain lots of fruits and vegetables (including leafy and root vegetables), whole grains, nuts and seeds, healthy fats, wild fish, antibiotic-free meat and chicken, pastured eggs, grass-fed milk and dairy products, and few processed foods. Look for clean, organic and non-GMO as much as possible. How does this diet affect your gut bacteria? High fiber foods “feed” beneficial gut bacteria. Sugars and other simple carbohydrate foods “feed” not-so-beneficial gut bacteria. In other words, give the beneficial gut bacteria the high fiber diet that supports them so they multiply more! At the same time, deprive the not-so-beneficial gut bacteria of the sugary foods they “crave” to in effect starve them. These products from Microbiome Labs are only available from healthcare practitioners such as myself. Listen to Kiran Krishan explain the Total Gut Restoration Program!